VedaPulse Cyber Monday Deals WEEKEND! 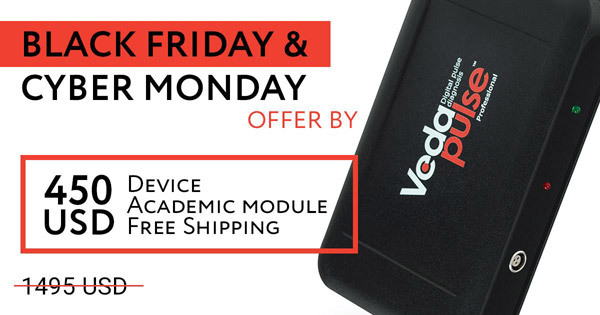 VedaPulse Basic version* (VedaPulse device + Academic module) costs $449.00 with free shipping! Save up to 70% on VedaPulse Professional (regular price $1495.00)! This version can be upgraded with any additional software modules from the VedaPulse price list. Add additional software modul "Constitution/Dosha balance" and take this set for just $1049.00! Leave your request today for booking this promotion for a week! *The configuration includes VedaPulse Professional signal recording device and Academic software module.